Below you’ll find our story on how we built this dream with our own hands. It’s been a wild ride so far, and we’ll update this page as the story continues! Work or money. If we have learned anything along the way it’s that nothing can be done without having one of the two. In our case, money was not it. As we stood in that uncleared forest dreaming about one day turning it into a vineyard, we never imagined how much work we would do. The first established property of Cedar Rose Vineyards consists of 2 acres of vinifera grapevines and is located on a piece of land that belongs to Barbara Carman, a parent of one of the partners and founders, Steven Becker. This property now displays a picturesque scene of young grapevines accented by natural Eastern Red Cedar trellis poles, but in recent memory the land looked quite a bit different. A young forest had been allowed to take root, creating an almost impenetrable mass of trees, shrubs, sticker bushes, and poison ivy. Clearing it seemed almost impossible at the time. With no heavy equipment or capital, we were forced to rely on physical labor and an ethic of hard work that has been forgotten by recent generations. 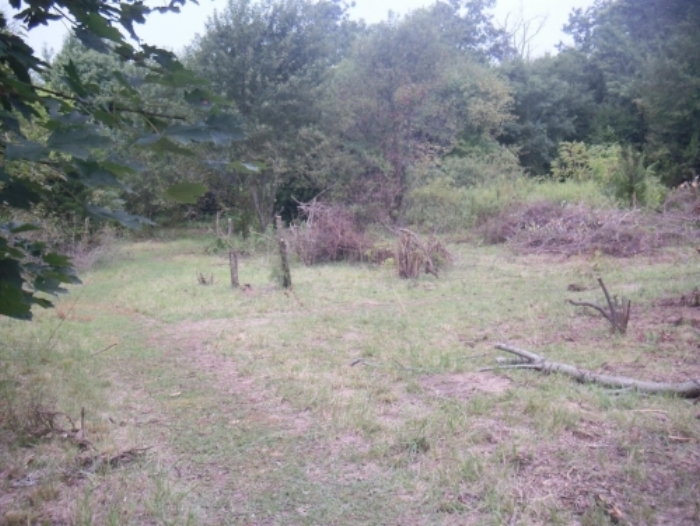 Through blood, sweat, and tears we slowly transformed the forest into the beautiful landscape that now graces this piece of South Jersey farmland. Standing in the shadow of the uncleared forest with a chainsaw in one hand and a shovel in the other, we realized the challenge ahead of us was greater than we could have ever imagined. Not knowing where to begin, we decided to take on two of the hundreds of small black walnut trees that made up much of the forest. Within minutes, the foes were vanquished, leaving only stumps and twigs behind. The next step was to dig the stumps out. After an hour of hacking, cutting, digging, and slicing, we stood back heaving, covered in sweat, blood, and dirt. We decided that we could not do this without professional help. 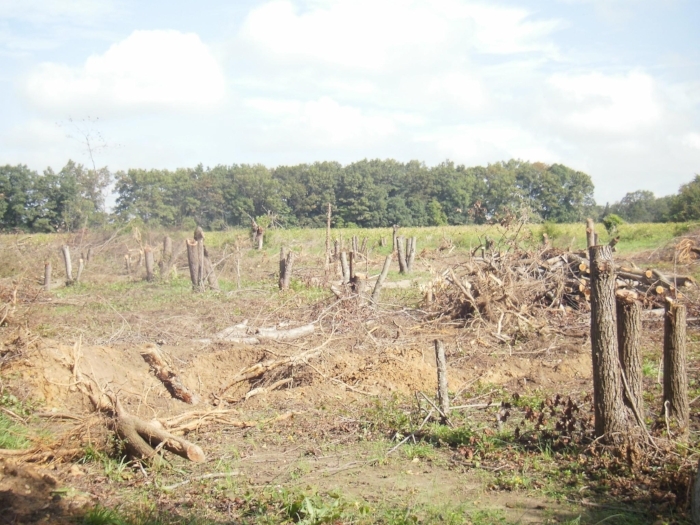 The next day we contacted a land clearing service, and after hearing the quote we realized that we would have to do this without professional help. Before long we were back in the forest, cutting down trees and clearing brush as efficiently as possible. As each tree fell and sunlight spilled across the forest floor, our dreams began to take physical form. We watched the morale of the group rise with each section cleared, pushing us onward ever faster toward our goal. As progress continued and debris accumulated, we came upon our first obstacle. How would we ever find a way to dispose of the massive amounts of biomass that would inevitably have to be removed from the property? Since taking it all to the landfill seemed impractical and renting a dumpster was out of our budget, we saw only one option: burn baby, burn. So began the night shift. We fell, cut, dragged and stacked by day in preparation for the long nights of burning brush that were to follow. The fires burned for weeks on end, blurring the line between day and night. Before we knew it, the fires began to grow hungry as the population of trees and vegetation on the site declined. As the last tree fell and the sound echoed throughout the barren landscape, we took a moment to celebrate our one small victory before turning to face the jagged field of remaining stumps that lay behind us. We needed help, and help is what we got. If we were ever poor financially, we were rich in resources. Steven’s father was the first to reach out, lending his time and equipment to help dig and rip out the stumps. Whether cherry or mulberry, he stood by us each day fighting the massive root systems that had developed over decades of growth. After weeks of grueling work the land lay flat and smooth, as it had not done in many years. With debris and stumps removed, it was now time to get ready for planting. Once more, we reached out for help. This time it was in the direction of Sam Pipitone Jr., a local entrepreneur and community figure. Without hesitation he offered a helping hand by taking time out of his busy schedule to come over in person with a tractor and plow to help ready our field not once, but twice. This was the first of many unforeseen acts of kindness that Mr. Pipitone bestowed upon us throughout this endeavor. 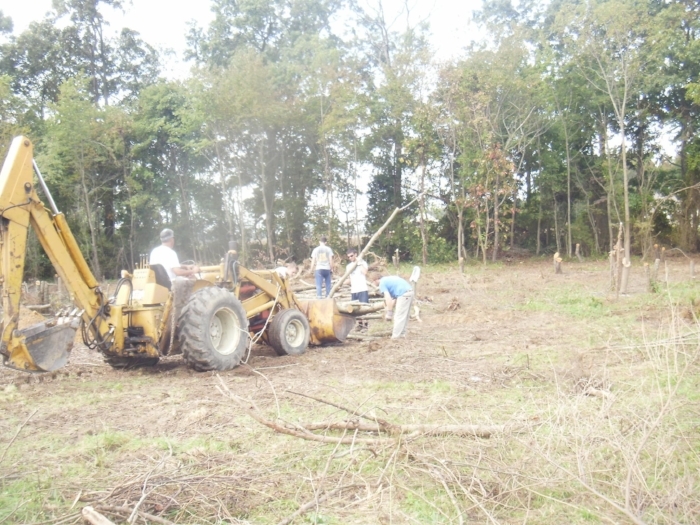 After plowing, the surfaced roots were cut and raked out of the field by hand. The field was leveled and smoothed out, a rolling tapestry of earth tones. We all stared in disbelief, remembering the forest that laid before our eyes four months ago. We had done it. The once wild land had been tamed, leaving behind a blank canvas ready for the brushstrokes of our imaginations. So much hard work had been done, and once again we celebrated, if only for a moment. This was truly only the first test in the long line of challenges that still lay ahead. We were tired, sweaty, and sore, but we had never been happier. Did we mention we had never been happier? That was before we realized how much work was left. Still, we remained in high spirits to tackle the next challenge. 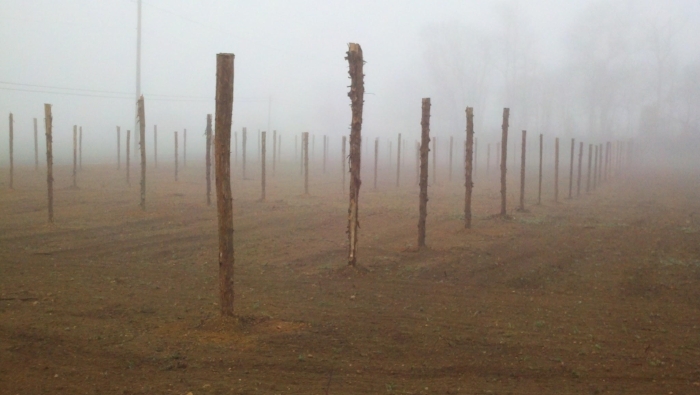 With the cleared field before us ready to plant we began researching vine and trellis costs. After one glance we realized we were once again outside of our budget. We started with the poles. We pondered the problem for some time until we eventually realized that the answer may be all around us. Would any native trees be suitable and abundant? Again, we researched (thank you, Google). We found that Eastern Red Cedar is not only native and abundant, but is also resistant to insects and decay. And so the hunt began. 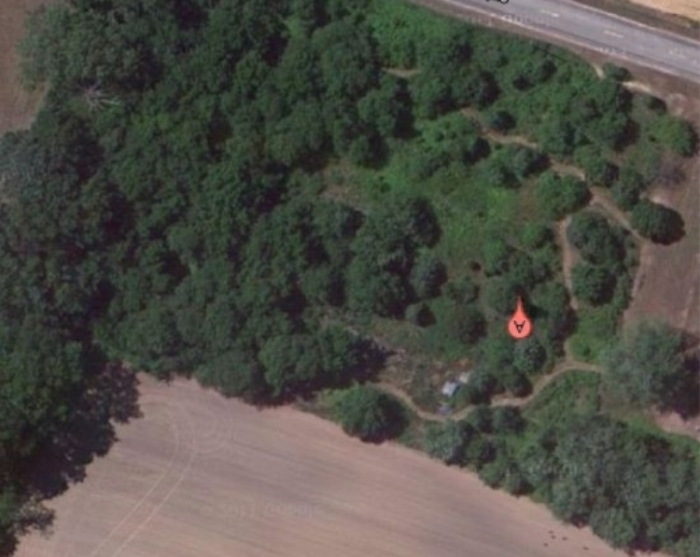 We discovered a few groves (the honeyholes) located behind Steven’s father’s house and began logging right away. The goal was a few more than 300 poles, a number that seemed astronomical as we cut, trimmed and carried each pole out of the forest. As months passed and the stack grew, we had to search deeper into the forest for more groves, adding length to the trek with each fallen tree. We fought daily with the denizens of the forest, breaking through spider webs while avoiding poison ivy (which was never truly avoided) and angry bees. In between tending to our wounds we worked, and eventually we reached our goal. We hauled them to the property and piled them high where they stood proud, awaiting their final resting place. The next question was how to get them into that place. That question was answered by our last resource Joe Smith who provided us with the tractor and auger necessary to drill the holes where the poles would stand. 300 holes later with a newfound respect for mechanical ingenuity, the poles were ready to be placed. Once installed, the skeleton of our new vineyard stood strong, a testament to the work already done and a glimpse of what the future may hold. Next was the main event. A few weeks before the plants arrived, we began the tedious task of digging each hole, again without the help of modern machinery. A modified hoe (grub hoe) was borrowed from Junior, the vineyard manager at Bellview, to dig each hole separately to ensure speedy planting. When the plants arrived, each vine was planted by hand in the space that it would occupy for the remainder of its life, providing these young vines with the optimal environment to produce exceptional grapes. Days after planting, vigorous growth from the buds gave evidence to the fact that the vines liked their new home.